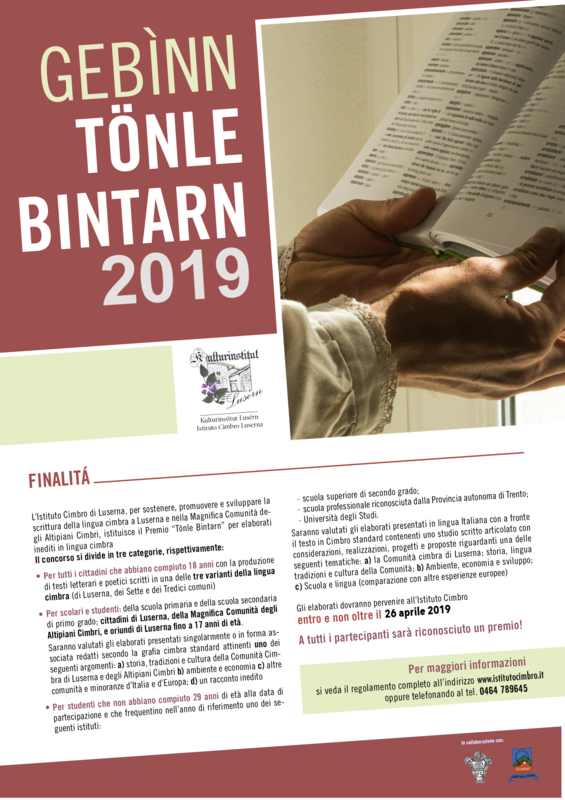 The Istituto Cimbro (Cimbrian Institute) of Luserna, in order to support, promote and develop the writing of the language in Luserna and in the Magnifica Comunità degli Altipiani Cimbri (so-called Magnificent Community of the Cimbrian Highlands), has instituted the first “Tönle Bintarn” Award for unpublished texts in the Cimbrian language. 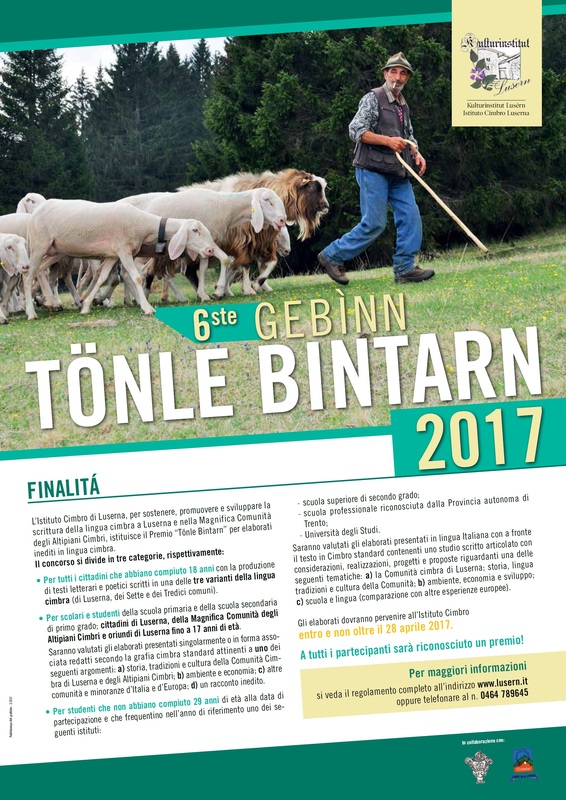 The Award is also offered in cooperation with the Cimbrian Institute of Roana and the Curatorium Cimbricum Veronense, since it also aims to stimulate and support the use of the Cimbrian language in its two variants of the Sette Comuni (Seven Municipalities) and Tredici Comuni (Thirteen Municipalities) communities. The contest comprises two sections: for literary and poetry text, and for pupils and students, respectively. Dar Kulturinstitut Lusérn, auzzohalta un vürzovüara ’z geschraiba in di Zimbarzung, saiz aftz Luérn saiz afta Zimbar Hoachebene, lekk au in Gebìnn Tönle Bintarn vor arbatn nia gedrukht geschribet in di Zimbarzung. 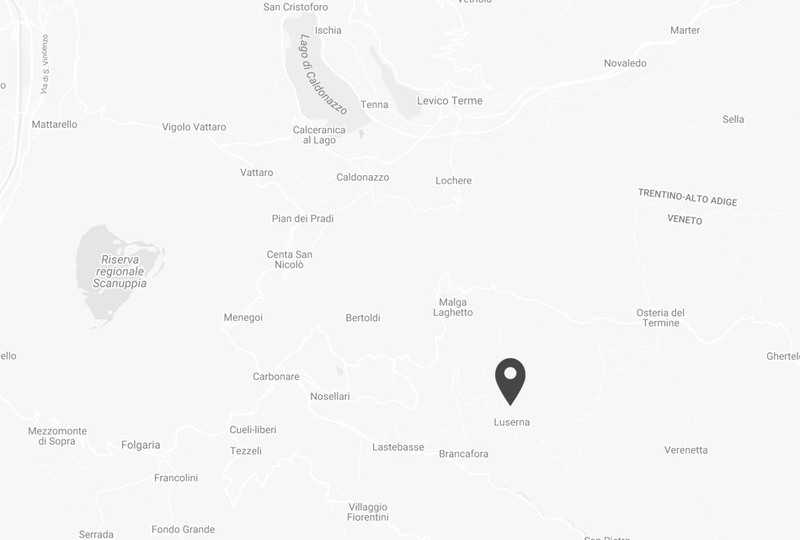 Dar gebìnn khint gemacht pittar hilfe von Zimbar Kulturinstitut vo Robaan un pinn Curatorium Cimbricum Veronese, ombromm a zil vo disan konkórs iz auzhaltn di zung in di VII un in di XIII kamoündar o.